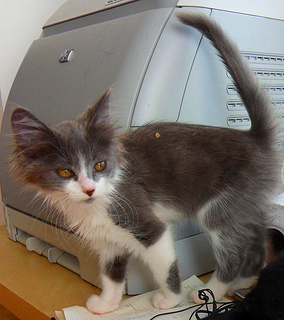 The Fluffasaurus Rex (Rex), Cassandra (Cassie), MacKinley (Mac), and Helix (Lixie) were a well-behaved bunch of kittens. Three of the four were cheerful and friendly upon arrival, but Helix was a socialization challenge because this gorgeous little flame-point Siamese was terrified of people. When we were taking the kittens out of the carrier, he hissed so vociferously that I expected to be attacked, but he turned out to be a gentle little guy, just very frightened. I had to be relentless with Helix. If he ran away and hid, I always made sure to retrieve him and hold him, until eventually he grew desensitized to holding, which reduced the potency of his phobia. He soon started approaching me when the other kittens ran to me for cuddles, and eventually became an affectionate lap kitten with us, though he was still easily startled and frightened of strangers. 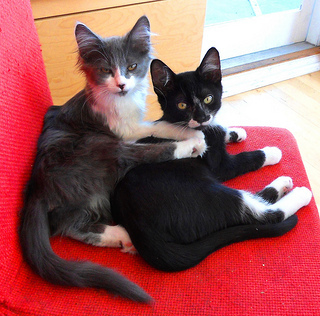 Cassie and Rex were pretty kittens, fluffy and easy going. 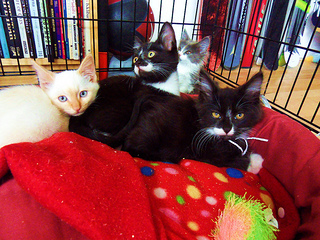 They liked their lap time and had no issues to sort out in terms of health or socialization. Cassie did enjoy nibbling on fingers, and I had to train her to be a little gentler with her love bites, but she was otherwise a perfect kitten (it’s never a good idea to encourage a kitten to bite; many people do this because they think it’s adorable, but it’s not so adorable when the cat grows up). 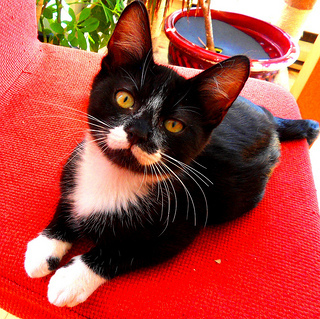 Mac was a sleek, high-energy little guy with a shiny seal-like coat and an unusually empathic personality. 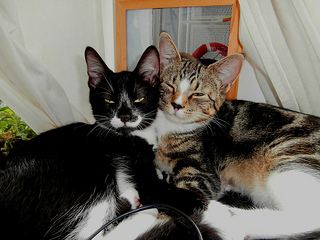 Whenever a human or another cat was sad or ill, Mac would be glued to the sufferer’s side, watching over the afflicted and trying to cheer him up. When our young resident cat Sage came back from neuter surgery, he was depressed about the giant cone on his head. The other cats avoided him because they were frightened of his strange appearance, odd veterinary odor, and wobbly drugged walk. Mac stuck by Sage during the first traumatic hours after his arrival, winding around him, rubbing his cheek against the cone, and doing his best to provide social support. Sage’s depression deepened quickly; he was a sociable cat and that cone had made him a pariah. I gave in and took it off when he started using it to scoop cat food and ended up with meat all over his face. Without the terrible encumbrance, he was successfully reintegrated into the colony (our other two cats had done gymnastics right after their surgeries to get their cones off; we ended up removing them early because we thought that having the cats doing acrobatics was more risky than the possibility that they would chew their stitches). 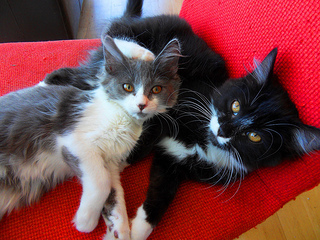 Rex and Cassie were adopted together and Mac went to a couple who subsequently adopted a friend for him from the Vancouver Orphan Kitten Rescue Association (VOKRA). We received a picture of the two of them snuggling together, the best of friends. 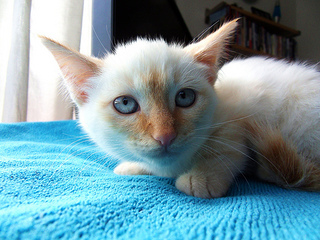 Helix was adopted as a companion for another flame-point Siamese cat. Our last update indicated that he was starting to come out of his shell and becoming affectionate with his new owner, though I suspect that Helix will always be quick to startle and timid around new people. Siamese cats seem to need a longer period of time with their mothers for optimum health and psychological well-being, and they are more inclined to suffer from problems if they don’t get at least 12 weeks with their moms. 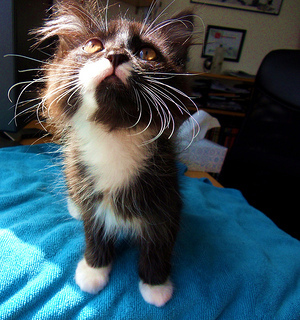 Most kittens can part from their mothers at 8 weeks, though 12 weeks with their moms is ideal for health and socialization. If they can’t be with their mothers beyond 8 weeks, having a few extra weeks with their litter mates is beneficial for their social adjustment.